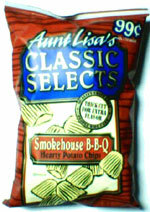 Taste test: These are thicker cut potato chips with a pretty good barbecue taste. The barbecue powder is of a smokier variety, rather than a sweet one. The thickness of the chip make these very tasty, and there is no greasy chips or any "overcooked" chips. Smell test: A good barbecue aroma. 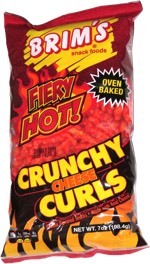 This snack was discovered by Keith at Sunoco station, Worcester, Massachusetts. Review published .